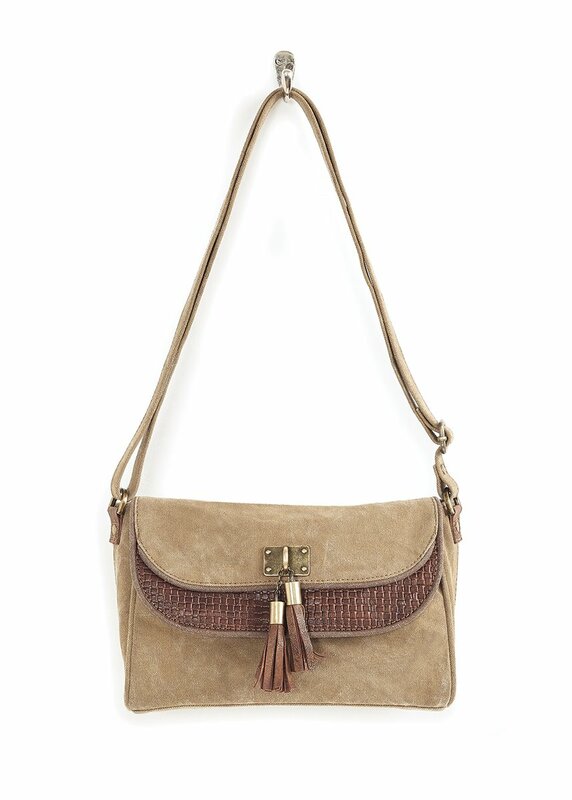 The Sloan Crossbody Bag by Mona B. is simply chic, with upcycled camel-hued canvas construction, vintage metal hardware, and leather accents. The front magnetic flap is highlighted by a pair of brown leather tassels and underscored by a leather stamped basket weave pattern. The interior is lined with the signature Mona B. cotton lining, and contains one zipped pocket. Adjustable canvas strap with 12-28" drop. Magnetic closure. Measures 10"W x 7"H x 3.25"D. Made from up-cycled canvas. The fabric shows the history of its travels which may include stitch marks, minor staining and unique scars and bruises. Color variations and patches add to the uniqueness of each bag. Heavy cotton canvas.